Now firmly entrenched in what is referred to as “The Rise of the Empire” era, these novels take place after Phantom Menace and before Attack of the Clones. It fills the gaps from one movie to the next with backstories on how Anakin Skywalker becomes a Jedi and grows into a man, as well as Obi-Wan Kenobi growing as a Jedi Knight and master. A well-written and rather lengthy (for Star Wars) novel by Greg Bear. It has an interesting plot and gave us some great background. I didn’t like it. The book, that is. The idea of the book is fine and there is no question that Bear has the talent to describe what is going on. But he took it too far. Giving us a blow-by-blow account of how the inhabitants of Zonama Sekot could create/build a living sentient ship wasn’t necessary and slowed the book to a crawl. Ruined the whole experience for me. Several clusters of two-page summaries would suffice, but instead Bear gave what seemed to be several sets of 20-page mini-novels on how these ships were made. On the plus side, we were introduced to an interesting race called “Blood Carvers” (doesn’t the name say it all? ), and more importantly – we were introduced to a fellow by the name of Commander Wihuff Tarkin. Look Familiar? 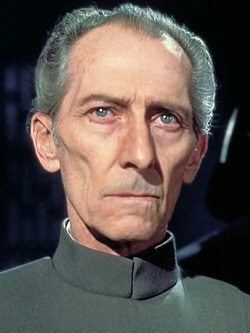 Tarkin was an ambitious young military leader who became more ruthless as the story went on. Eventually, he stole plans from his friend (or rather – took credit for them) for an ultimate weapon (wonder what it is?) that he would propose be built. The Jedi Quest series is a set of young adult novels by Jude Watson. Sound familiar? Yep, she penned the Jedi Apprentice series. And that series improved with every book as her writing skills and storytelling improved with experience. As I expected, Jedi Quest starts off very well. The growing pains are behind Watson and she merely duplicated the idea of Apprentice and applied it to Quest. Then she just had to change the personalities accordingly. Instead of a Qui-Gon/Obi-Wan relationship, she developed an Obi-Wan/Anakin relationship. In these first three books, Anakin is 13 and 14, going on some of his first quests. The novel paints him as headstrong and impatient, but does a better job of it than the movies (understandable, given all the pages that Watson has to work with). These are quick, easy and fun reads just like Jedi Apprentice. And as a 10-14 year old, I would have been over the moon reading this stuff. Even now, at 39, I enjoyed them. Up to this point, the Star Wars novels I’ve enjoyed the most have been the Darth Bane trilogy, the Revan novel and the Darth Plagueis novel. Add Outbound Flight to the list. I thoroughly enjoyed this one by Timothy Zahn. Not only did it give us great insight into the political maneuverings of Darth Sidious (Palpatine) and the Trade Federation, but also introduced us to a new race called the Chiss. The Chiss are based far outside the Outer Rim and into Unknown Space – territory unexplored by the Republic. The Chiss commander known as Thrawn is one of the most interesting characters introduced to me in the Star Wars novels and I easily place him alongside Darth Bane, Darth Revan and Darth Plagueis in that regard. Zahn performed wizardry in his development of this character’s military brilliance. Without researching Thrawn any further – I sincerely hope we meet him again in future novels. The book explored other things, such as a Jedi’s descendancy into the Dark Side, a reluctant spy’s growing friendship with Thrawn, and a cunning spy’s adaptability to different situations. Well, I’m 47 books into my adventure. Only, like, 150 or more to go. Not looking like I can do it in a year. I read before going to bed, during lunch and on the treadmill every day.